It’s all an illusion… | Finding delight. I, like many people my age, spend a lot of time online. I keep up to date with my friends near and far via Facebook feeds, I read an insane amount of blogs and lately, I find myself killing a lot of time on Instagram and Youtube. However, I try to take in this media with a constant reminder that someone’s online presence isn’t necessarily their reality…that these bitesize presentations of “life” are more performance than holistic depictions. 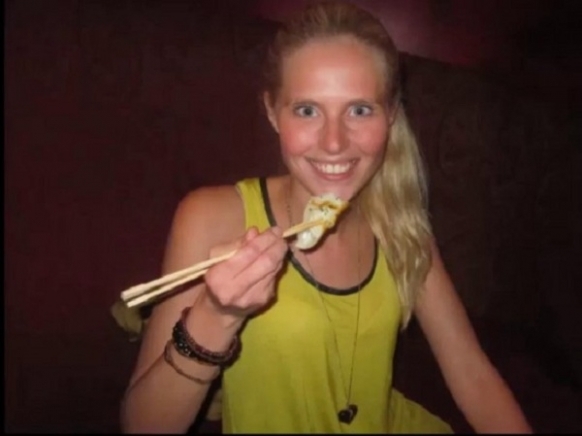 For the next 5 weeks only her boyfriend knew the truth…She was actually still in Amsterdam–dining at Asian restaurants, visiting Buddhist temples and swimming in her apartment’s pool (those fish you see above? Photoshopped). But Zilla’s prank wasn’t part of some awesome Dutch MTV reality show where Catfish meets Punk’d. The hoax was part of a university project highlighting how we manipulate and filter (literally and figuratively lol) ourselves on social media and how easy it is to create an online “reality” completely void of the truth. I will certainly keep Zilla’s project at the back of my mind the next time I’m feeling a little green with envy while perusing perfectly styled plates of food on Instagram or intricate DIY craft projects on Pinterest. I will consider the scenes which were left to whither on the cutting room floor.